As bacterial build up within your mouth can travel down your digestive tract and affect your whole body, it is important that you look after the health of your teeth, gums and mouth. The astringent herbs in Ayurdent Classic strengthen the gums and refresh the taste buds while essential oils kill bacteria and give fresh breath and a fresh taste in the mouth. This formula has quite a strong action and taste so only a small amount is needed for each brushing. 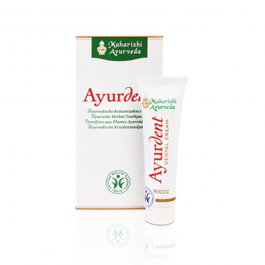 For a milder product with the same ingredients try our Ayurdent Mild toothpaste. 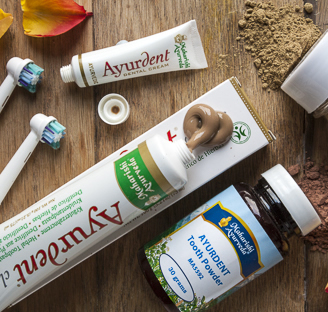 Other products in our oral health range are Ayurdent Tooth Powder, Ayurdent Mouthwash and Tongue Scrapers. For healthy mouth, teeth and gums. This natural and holistic formula cleanses deeply to rid your teeth and mouth of bacteria and toxins while supporting the health of the gums and helps prevent tooth decay. Free of fluoride, foaming agents and gluten. Use sparingly. Place a small quantity on a toothbrush and brush the teeth thoroughly. Then rinse the mouth.